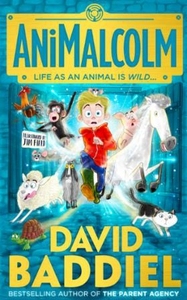 From David Baddiel, the brightest new star of children's books and winner of the LOLLIES award, comes a laugh-out-loud adventure for every child who ever wondered what it might be like to be a bit of an animal... Malcolm doesn't like animals. Which is a problem because his family love them. Their house is full of pets. What the house is NOT full of is stuff Malcolm likes. Such as the laptop he wanted for his birthday. The only bright spot on the horizon is the Year Six school trip, which Malcolm never thought his parents would pay for. And yet there he is, on the bus, heading to... oh no. A farm. Over the next days, Malcolm changes. He learns a lot about animals. More, in many ways, than he would like. He learns what it's really like to be an animal. A whole series of animals, in fact... It does make him think differently. And speak differently. And eat differently. And, um, smell differently. But will he end up the same as before? Because sometimes the hardest thing to become is... yourself.